We had this cake last week for the 4th of July holiday. It was the perfect ending to our feast. This was inspired by Brandi over at The Country Cook. She makes all kinds of fun pudding cakes and a few weeks ago she posted a Banana Pudding Poke Cake. Brandi used banana flavored pudding and cool whip. I decided to make this a more traditional version of banana pudding. I used vanilla pudding, Nilla wafers, sliced bananas and homemade whipped cream. I made the cake the day before we ate it so the Nilla wafers could soften. It tasted fabulous! I took the leftovers to work and it was a huge hit! Bake cake in a 9x13-inch pan according to directions on the box. Remove the cake from the oven and poke holes all over the cake with a wooden spoon handle. Whisk together pudding and milk. Pour over cake, making sure it gets down in the holes. Put a layer of Nilla wafers on top of the cake. Put cake in the refrigerator and allow cake to cool completely. Once cake has cooled and pudding is set, slice bananas and layer on top of the Nilla wafers. Whip together heavy cream, powdered sugar and vanilla extract. (I chill my mixing bowl in the freezer for 5-10 minutes before adding the cream and sugar). Whip at high speed for 1-2 minutes. Spread over cake and top with crushed Nilla wafers. I made this recently for a cookout and used banana pudding instead of bananas and it was delicious! Love all your recipes! 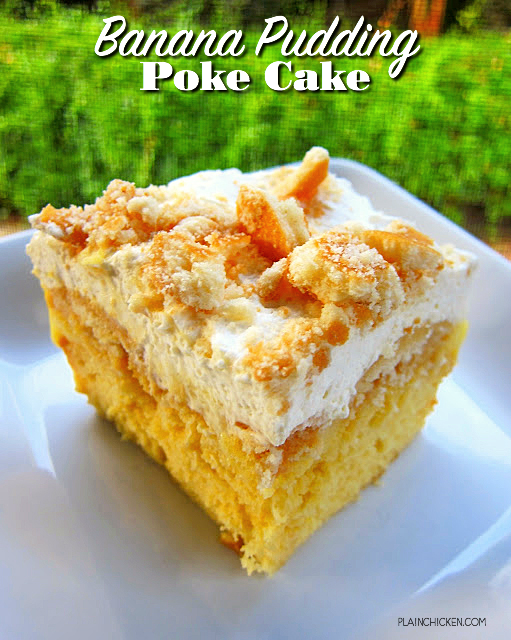 I have been making Poke cakes for many years and just the other day made this banana flavor but used banana cream pudding and it was amazing .. I saw that recipe and thought it looked good. Yours looks very good too! Steph - we are two peas in a pod. I love that we love the same kinds of foods. And I love your picture for this too. Looks. SO. Good! Gee you've got to stop posting such terrific recipes. I print them all out and not enough time to make them all. LOVE your blog! Made this Monday night, refrigerated and added bananas and Cool Whip (sorry, was too lazy for the homemade whipped cream)last night before serving. Yummy! It has such a cool, light taste. Definitely a "keeper"! Thank you for sharing! This cake was delicious! I made it on Saturday for my husband who doesn't eat cake b/c he hates icing. BUT he loves banana pudding. It lasted 3 days. Thanks for sharing this awesome recipe! I'll definitely make this again!